Some folks try to convince themselves that beans and rice will get them through the darkest days of their lives. At Safecastle, we allow our customers to make more thoughtful choices in building their food storage. Thanksgiving Dinner Combo Case ... No doubt about it, if you survive a disaster, you'll have much to be thankful for. Chocolate Candy Variety Case ... Life without chocolate? It doesn't have to be that way. Comfort foods definitely have their place in any well-thought-out storage program. Make sure you have considered what will complete your survival stash. all Future Essentials products are on sale! 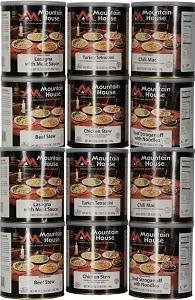 The last maximum-discount sale of the year for Mountain House canned freeze-dried foods ends tomorrow, Nov. 20. Almost 40 of the best-tasting, most highly regarded emergency storage foods in the world--over 40 years in business, proven shelf life of 30+ years. If you're going to prep, do it well. When Safecastle runs a serious sale, serious preppers take note. Right now, not only are our Mountain House foods on sale, but so are Yoders meats, Bega Cheese, Red Feather Butter, Grandmas Country Milk, Future Essentials varieties, and more ... all Class-1 quality storage foods in cans that store for decades. Are you serious about prepping? Shop now. Last Mountain House sale of the year. Future Essentials, Bega, Red Feather, Grandma's Country & Yoders On Sale Too! Last Max-Discount Sale of the Year for MH Cans! ... and Our Yoders, Future Essentials & Other Brands Too are Now On Sale! If you're going to do something, do it well. You can prep like you mean it or you can do it on the dirt-cheap (which is really more like going thru the motions & setting yourself up for catastrophic failure). Class-1 preps are the storage foods and gear that are of only proven top-grade quality. That's what we deal in at Safecastle, period. So when we run a serious sale, serious preppers take notice. Safecastle is running our last 2013 Mountain House cans sale of the year from now till November 20, 2013. Discounts are the maximum allowed today, from 25% to 35%, and with free shipping to the lower 48 of the United States for buyers-club members and non-members alike. * We have also marked down all our Yoders and Future Essentials varieties as well, and several other top preps are on sale too. That's a lot of great storage food at good discounts, folks. In fact, just for good measure, we are also throwing in a FREE case of canned Hot Dogs with every five cases of Yoders meats purchased in a transaction. Also important--we are heading into the home stretch for our Loyalty Royalty program. All participants who have made purchases through the Loyalty Royalty program period will win! ... and some will be big winners indeed! This program directly impacts your preps'' bottom line! 126 Major Preps On Sale Today! ... Mountain House, Future Essentials, Yoders, Lifestraws, more! Outstanding deals and mega discounts are to be had today at Safecastle on the best storage foods in the marketplace: Mountain House, Bega, Red Feather, Future Essentials, Food for Health International, and Yoders. Shelf life measured in decades! Nutritional quality and taste judged by satisfied return customers. Many other needed items are on sale as well such as LifeStraws and Montague folding bikes. 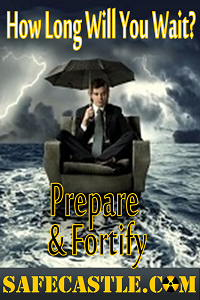 Safecastle is a premier buyers club for serious preppers. Non-members enjoy great savings and free shipping, but club members get the biggest discounts, rebates, and incentives. Join today and get ready for what's coming. Last Maximum-Allowed-Discount Sale of the Year for Mountain House Cans! Safecastle is running the last 2013 Mountain House cans sale of the year from November 7-20, 2013. Discounts will be from 25% to 35%, with free shipping to the lower 48, for buyers-club members and non-members alike. Also important--we are heading into the home stretch for our Loyalty Royalty program. All participants who have made purchases through the Loyalty Royalty program period will win! ... and some will be big winners indeed! Note that we're offering a very limited number of special 3-case variety packs of Mountain House foods. We do this just once a year and as luck would have it, we still have some available for the last MH sale of the year, beginning Nov. 7. During this sale, only while supplies last, these kits will be sold at a huge 35% discount! Safecastle Loyalty Royalty Prizes; 18-can MH Kit, Canned Cheese & Butter On Sale! The November 1 Loyalty Royalty prize drawing winner has been posted. The program standings have also been updated. The final monthly drawing will take place December 1. That final prize will be for one of our newest cool products--the Prepare My Life Planner. In late December (the purchase rebate program ends December 21), all participants who have made purchases through the Loyalty Royalty program period will win! ... and some will be big winners indeed! We're offering a very limited number of 3-case variety packs of Mountain House foods. We do this just once a year and these kits get scooped up quickly, so move fast if you would like to add a quick, affordable dose of big variety to your larder. These kits consist of 18 #10 cans of some of the most popular Mountain House varieties ... 18 different varieties ... at a 10% discount! Order now & these 3-case kits will ship to you from our Safecastle warehouse within one to two business days. Got preps? More than 40 must-haves are on sale now! If the entirety of your September MH order is not yet in hand, we expect you to take delivery of the remainder of your order within one to two weeks. There are a large number of backordered shipments going out this week. My MH rep tells me this morning that there remains a small number of varieties yet to be produced and canned and that process will be completed within about 10 days. Mountain House does not note backorders on their packing slips, so if you have received a partial order, the balance WILL be shipped to you as soon as it is back in stock. Your business and your patience are appreciated. The September surge in orders for MH food was unprecedented in its volume and scope, and it obliterated inventories of all varieties at the MH warehouse. The factory is working hard to replenish stocks and fill remaining backorders. Our distributor for the world-famous canned Red Feather Butter and Bega Cheese is offering us a special discount for a short time on those products. Get them today at a member-discount and sale price that can't be beat! We awarded many "Trucker's Friend" Survival Tools to qualifying buyers early in September. Those are now scheduled to arrive to us here on Wed., Nov. 6. We will ship them out as soon as we have them.